Presented at the awards gala will be this first in a series of wooden Meigs County ornanments created by Red Tail Design. The only way to receive the ornament is to attend the gala. RACINE — The Meigs County Chamber of Commerce is gearing up for its annual awards gala, which will take place this Thursday, Nov. 1 to honor the best in local business and community service. The event takes place at Kountry Resort Campground in Racine. Social time will be from 5-6 p.m. with dinner served at 6 p.m. Organizers are expecting a sold-out event. The keynote speaker is Meigs County Economic Development Director Perry Varnadoe and a unique gift is awaiting attendees. According to Chamber officials, the awards gala is a time of inspiration and celebration for Meigs County, as well as an opportunity to recognize Chamber members and outstanding local businesses. This year, the Chamber will present awards in six categories: Entrepreneur of the Year, Best First Impression, Economic Impact, Lifetime Business Achievement, Community Pillar, and Outstanding Chamber Ambassador. In addition to these awards, a new category was added to recognize outstanding Meigs County citizens. This new award will be presented to an individual or individuals who best embody the spirit of Meigs County, one who is committed to the betterment of the community, and one who is willing to go above and beyond. Nominations were open to any citizen from Meigs County, and anyone was eligible to make a nomination. Each of these awards is considered a tremendous honor, according to Chamber officials. As for the keynote speaker, Varnadoe offers 20 years of economic experience in Meigs County. His local successes include assisting with the establishment of the East Meigs Industrial Park, the Meigs Medical Complex, and the Rio Grande Community College campus. In addition, he helped create the Revolving Loan Fund which assists business growth within the community. Varnadoe has served in a leadership role in virtually every economic development organization in the state of Ohio and he has served as a board member of multiple organizations including Gallia-Meigs Community Action, Ohio Economic Development Association, Rural Action, Buckeye Hills, and Workforce Investment Development. The Meigs County Community Improvement Corporation partnered with the Meigs Chamber as an event sponsor for 2018. This sponsorship is in recognition of the late Horace Karr and the late Steve Story, both of whom played a crucial role in the economic development of Meigs County. Karr and Story were also past Chamber presidents; additionally, they served on the CIC board. “Their leadership produced families that have accomplished extraordinary achievements and have fought for the improvement of our Meigs County home. Recognizing the dedication that both families have delivered, they are being honored for their hard work, leadership, and all they compassionately do as dedicated citizens of Meigs County,” stated a press release from the Chamber. Another special addition to this year’s gala is a gift to attendees that is one-of-a-kind. 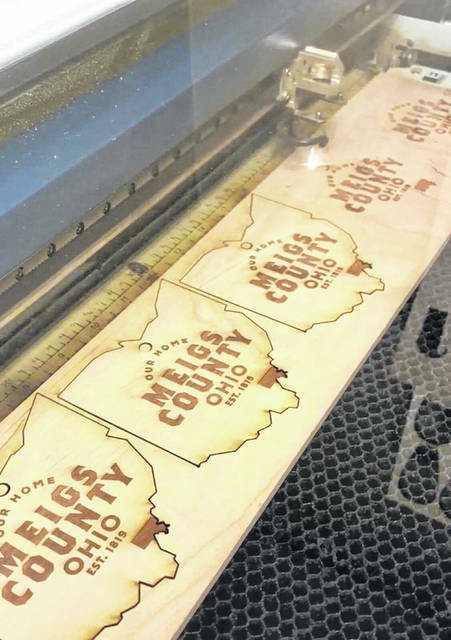 Presented will be the first in a series of wooden Meigs County ornaments created by Red Tail Design. The only way to receive the ornament is to attend the gala. Dinner will be provided by Close to Home catering. This event is open to the public. According to the Chamber, seats are filling fast. For those wishing to attend contact Chamber Director Shelly Combs, at 740-590-0488 or call 740-992-5005. Information for this article submitted by Shelly Combs on behalf of the Meigs County Chamber of Commerce.